Update: The electronic music luminary group, Squarepusher has joined the lineup for the festival. The Festival of Disruption announced its 2019 lineup, including performances by Garbage and Wye Oak.The two day event will take place in Brooklyn, New York from May 17-18. Festival of Disruption was curated by David Lynch in partnership with the Bowery Presents. Its benefit concerts will donate all the proceeds from the shows to transcendental meditation to people suffering from PTSD. This is in support of Lynch’s Foundation’s effort to help people who currently suffer from post-traumatic stress including children and adults who suffer from acute levels of trauma and toxic stress in their lives. With two days of concerts, May 17 will feature Wye Oak, the Messthetics and Mercury Rev. May 18 will feature Garbage, Phoebe Bridgers and a DJ set from LCD Soundsystem’s Nancy Whang. The lineup not end there as additional guests will be revealed at a later time. 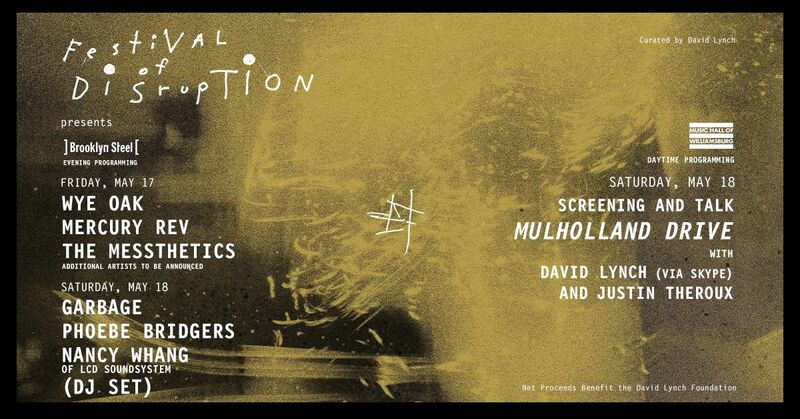 Along with the music performances, on May 18, the Foundation will present Lynch’s 1988 film Mulholland Drive and then a conversation with Lynch and actor Justin Theroux will follow. One of the groups playing the festival, Wye Oak, have bee busy playing festivals and releasing a new video for their single “It Was Not Natural.” Fans can expect a lively performance from the indie rock band. Another group performing, Garbage, have members who still fondly remember random visits from David Lynch to the band’s studio in Wisconsin when he vacationed in the area in the 1990s. The group released a new song titled “Destroying Angels” in early January, depicting a dark and serenely mystic image. Undoubtedly festival goers can expect a great performance of this new song. Tickets for the shows go on sale March 22 at 10 AM and can be purchased here.